The Army on Michaelmas Day, 2016 had proclaimed that it dole out the cross-border strikes, days when many Indian troopers were martyred in a very pre-dawn terrorism on the military Headquarters in Jammu and Kashmir's Uri. Prime Minister Narendra Modi got hold of the Jodhpur Military Station Friday morning to inaugurate 'Parakram Parv' -- associate exhibition to commemorate the second day of remembrance of surgical strikes conducted by the Indian Army against terror camps across the road of management in 2016. 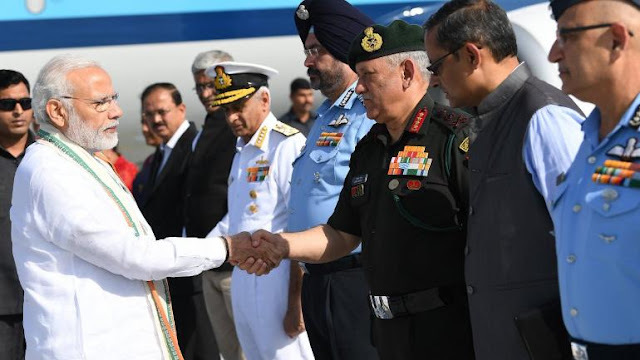 PM Modi was among Defence Minister Nirmala Sitharaman, Union Minister Gajendra Singh Shekhawat and Rajasthan Chief Minister Vasundhara Raje. The Konark Corps unionized the exhibition on Indian Army's combat capability on the occasion. troopers performed numerous drills in combat gear.